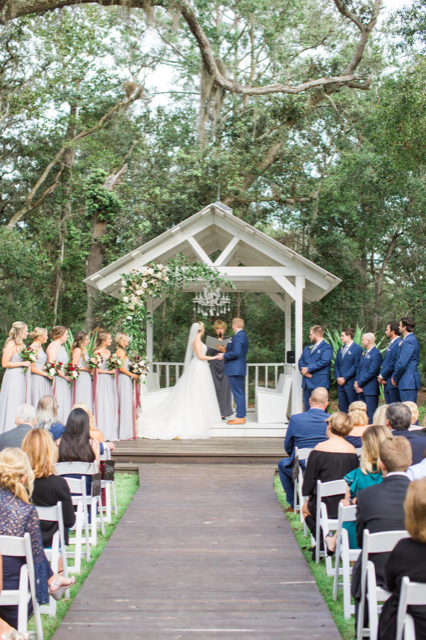 Living in Orlando is a perpetual delight for Alaina and Ryan who work in the region known as the “happiest place on earth.” However, for their wedding, they desired a venue that was just as magical as where they live—yet rustically romantic. They found their dream venue at Chandler Oaks in St Augustine, Florida. This unique venue in the heart of Florida is a working farm–and is an enchanting journey from Orlando. Guests were greeted by a 1950’s pickup truck with a sign directing them to the winding dirt road that led to the ceremony site. Outside of a large white barn was an antique “donut” food truck and vintage “Country Store.” Inside the barn were chandeliers and double doors leading outside to a gazebo adorned with glorious flowers —surrounded by an enchanting forest and native wildlife. And….for Ryan and Alaina…..THE BEST IS YET TO COME!! !